Wow! It’s been quite a while since my last post. Time flies… especially (it seems) as I’ve gotten older. Maybe it’s because the earth spins faster… Naw! That can’t be it. Maybe I’m in a time warp where the clock spins and time is accelerated? Naw! That can’t be it. I suppose time seems to fly by more quickly now that I’m older because I realize time is my most precious commodity and so I try to squeeze every bit of value out of each day… each hour… each minute! and when I waste time (which I do) I am profoundly aware of that lost time. But I didn’t intend to write about time flying. What I intended to do is chat here about how it’s never too late to make changes, try new things and go out on a limb. The reason all those things are on my mind lately is over the past few months things have been changing for me. Some changes are the result of conscious decisions and others are seemingly happening as a result of those decisions. But the unfolding that is happening I know with certainty is nothing short of miraculous. 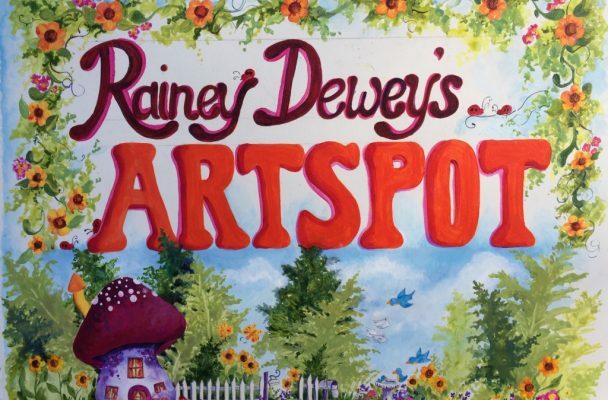 When I went to retrieve the “Rainey Dewey ArtSpot” for posting there from my hundreds of electronic images I noticed that the photograph was taken on April 2, 2017, just after I finished painting it. At that time I was contemplating changes and so rather than push the sign into the ground out in front of my studio I tucked it away for posting later… when I decided what I was going to do and where I was hoping to be. And so I sit nearly a year and a half later in a new place. This new place is both physical, mental and emotional. In this new place I hope to stretch myself artistically and teach others with a hankering to learn to paint using watercolors. In this new place I hope to bloom into a new person somehow getting a handle on some of my persistent negative behaviors. In this new place I hope to paint a masterpiece or two or three! My mind is renewed just by deciding to change something and my interior is changing and evolving. The desire is strong and hopefully the flesh can be tamed into tagging along for this change journey. Deep huh? I didn’t intend to go deep but why not. That’s what we’re here for. To become better people, loving God, loving each other, sharing our gifts, making corrective paths when necessary… our journey is never over no matter our age, no matter how fast the earth spins. Changing it up for me was necessary and timely. So stay tuned to see where this thing goes. It could be simple, it could be grand. That’s the thing about life you just never know for sure what’s going to happen.